In tectonically active regions of Central America, it is common for solute-rich groundwater to emerge at gradient breaks within the complex volcanic topography of mountains and foothills which inter-grade with the coastal plain. Solute-rich groundwater associated with underlying volcanic activity alters the chemistry of receiving streams throughout Central America. 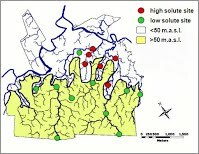 These groundwaters can significantly influence stream solute chemistry and related ecosystem-level processes. Regional groundwaters, surfacing at the gradient break between the Central Mountain range and the coastal plain at La Selva Biological Station, Costa Rica, have high levels of phosphorus (up to 400 μg SRP L-1) and other solutes (Ca, Cl, Mg, SO4) but are not elevated in temperature. Spatial patterns in stream solute chemistry are determined by geomorphic features of the volcanic landscape that include: upland lavas drained by P-poor streams; a gradient break (~50 m.a.s.l. ), at or near where P-rich springs emerge; and lowland alluvial areas drained by streams that are either P-rich or P-poor depending on the contribution of solute-rich groundwater. The STREAMS project main goal is to understand how inputs of solute-rich groundwater modify stream ecosystems draining this tropical landscape. Water for Life is our outreach program - includes projects with the local communities near the station and online teaching tools on river conservation and water quality and quantity issues for high school students - both Spanish and English.